– Sports scientist Ross Tucker talking about the effect the IAAF’s new rules on testosterone limits for women will have on Caster Semenya. Did you somehow negative split Boston this year? Tell us how you did it. What is the most basic reason for the success of the LetsRun web site? What are FUN questions to to ask runners at a track meet? Where do sub-elites get hung up? LRC Relays Weekend Preview: Jenny Simpson Goes For 2-Mile AR, Sydney McLaughlin Set For 400H Debut, & Andre De Grasse Is Back It’s relays week – normally one of the greatest weekends of the year for college track fans – but this year’s calendar has us a little depressed as the big guns aren’t competing with each other. Instead of everyone going to Penn or Drake, a few are now going to Arkansas, others to LSU and others aren’t going anywhere. Still, there are a few amazing races that we are really excited about but most of them are ironically individual races. Jenny Simpson just crushed the US outdoor record for 2 miles Drake with 9:16.78! She won by 15+ seconds and ran 63 for her final 400. Sam Kendricks wins Drake pole vault with new meet record of 19′-1.5″ Vashti Cunningham won the HJ at 6 feet, 4.25 inches. Isaiah Harris gets stick down by nearly 4 seconds, guy in leads runs 1:48 but Harris wins thanks to 1:44.74 The MB poster thinks it’s one of the best relay carries in Penn Relays history. Casey Comber gives Nova upset win in men’s DMR He went from from 3rd to 1st, Notre Dame 2nd, Princeton third. Villanova Women’s DMR wins DMR yet again That’s 6 out of 7 thanks to a dominant 1200 leg by Nicole Hutchinson. Recommended Read N.J.’s 47 greatest performances of all time at the Penn Relays From Marty Liquori to Carl Lewis to King Ches, they have you covered. Leroy Burrell is back at Penn Relays with his fleet Houston Cougars Burrell, the former 100 WR holder, says one of his career highlights came at Penn. Did you know Burrell won a PA state title by himself in HS? Recommended Watch: Ross Tucker Analyzes The IAAF’s New Hyperandrogenism Policy With Regard To Caster Semenya Tucker believes there needs to be regulations that “protect the boundary” between men’s and women’s sports, but doesn’t think the science is strong enough to hold up in court and predicts that the IAAF regulations won’t stand up to a legal challenge from Semenya or someone else. Dutee Chand Has Offered Caster Semenya Her Legal Team It was Chand’s legal challenge against the IAAF’s original hyperandrogenism rules that got us to where we are today when CAS suspended the IAAF regulations. Deadspin: “The Only Point Of Track’s Dumb New Testosterone Rules Is To Make It Illegal To Be Caster Semenya” Whatever your take on the IAAF’s new regulations, there is no way they are as dumb as this headline. Q&A With IAAF Doctor Stephane Berman On New Testosterone Rules Apparently the new IAAF rules won’t necessarily apply to smaller level competitions so Caster Semenya could hypothetically still compete at SA Nationals without hormone treatment. USATF Drake Relays Preview Distance action includes the women’s 2-mile with Jenny Simpson, Brenda Martinez and Alexa Efraimson. Riley Masters (4:03.1) And Emily Lipari (4:32.9) Win USATF 1 Mile Champs At Drake Relays’ Grand Blue Mile Lipari just beat out Brenda Martinez by .2 while Masters beat out Eric Avila (4:03.9). Jenn Suhr (4.80m) Defeats USA Indoor Champs Katie Nageotte (4.70m) And Sandi Morris (4.70m) To Win Drake Capital Square Pole Vault On the men’s side, Andrew Irwin cleared 5.60m to got an upset victory over Shawn Barber (5.60m, lost on countback) and Sam Kendricks (5.50m). USATF Release: Atlanta To Host The 2020 U.S. Olympic Marathon Trials Atlanta won the bid over Chattanooga, Tenn.; Austin, Texas; and Orlando, Florida. *MB: Atlanta to host 2020 Olympic Marathon Trials Start training now. Feb 29, 2020 will be here before you know it as it’s only 678 days away. Kipchoge needs to win New York and/or Boston (real marathons) to secure his legacy as the GOAT We guess the poster forgot he crushed everyone at the Olympics. Mo Farah – Greatest Range of Any Distance Runner Ever? Farah, who has a 3:28 1,500 PR, ran 2:06:21. Does today’s race mark MO FARAH as competitive on the world stage? Can we please stop with the WR attempts at London? We 100% agree. And if they are going to go for the WR, can they at least go at the right pace? MO FARAH wants to fight Motorbike guy! Kennenisa Bekele – Interview after the race – No excuses given Bekele was sixth in 2:08:53. *MB: Paula Radcliffe’s WR could go down this weekend, what questions would you like us to ask her this weekend? 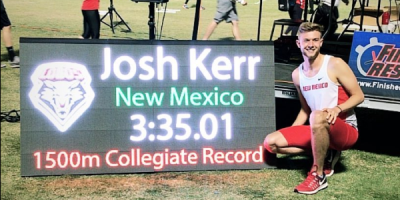 LRC New Mexico’s Josh Kerr Runs 3:35.01 To Break NCAA 1,500m Record As impressive as Josh’s run was, Jim Ryun ran 3:33.1 as a collegiate sophomore 51 years ago but it wasn’t during the collegiate season. In our minds, anything achieved before you go pro or up through the NCAAs of your senior year is the real collegiate record. *Why Isn’t Jim Ryun’s 3:33.1 in 1967 the American Collegiate Record? Grenada Invitational: Justin Gatlin Runs 10.05 To Win 100m Over Isiah Young (10.11) And Mike Rodgers (10.17); Tori Bowie Wins 200m In 22.75 Other winners included LaShawn Merritt (200 – 20.57), Hannah Cunliffe (100m – 11.42), Shamier Little (400 – 51.45) and Kori Carter (100H – 12.79). Mt. SAC Relays: USC’s Twanisha Terry Runs Fourth-Fastest Under-20 100m In History With 10.99 At Mt. SAC Recent world indoor record setter Michael Norman won the 400 in a PR of 44.53 while World U20 silver medalist Lynna Irby won the women’s race in 50.95. Other winners included Brianna Rollins in the 100H (12.43), Fred Kerley in the 200 (20.48), Olympic champ Dalilah Muhammad in the 400H (55.25), Jeff Demps in the 100 (10.08). *Results Georgia’s Jessica Drop won the 5,000 in 15:38 while Japan’s Yuki Fukuda took the 1,500 in 4:16.64 over Charlene Lipsey (4:16.76). Thursday @ Bryan Clay: Evan Jager (13:24) And Marielle Hall (15:39) Start Seasons Off With Wins As DII’s Sydney Gibaduday Beats D1’s Matthew Baxter For Top NCAA Honors Nice run by Gibaduday for top NCAA honors. Acceptable rust buster for Jager in our book, but at least one guy disagrees. LRC Week That Was: Eliud Kipchoge Is The GOAT, Paula Radcliffe Is Too, Josh Kerr Runs Fast, But Nick Willis Is Still King Plus Commonwealth Games, Joshua Cheptegei, Tim Don update. And Sarah Sellers wasn’t the only one to negative split Boston. LRC Mo Farah Showed Us The “Size Of His Balls” And Earned Even More Respect Farah tested his limits in London. Shelly-Ann Fraser-Pryce Isn’t Done With Track After Giving Birth To Her Son Last Summer Fraser-Pryce says she believes she can still dip below the 10.70 barrier,something only three women (Flo-Jo, Carmelita Jeter and Marion Jones) have ever done. Yohan Blake Is Putting Commonwealth Games Disappointment Behind Him Blake was the big favorite, but only managed third. *MileSplit: This Is Actually Duplantis’ First Ratified Mark Over 19 Feet Due To Past Jumps Not Meeting The IAAF Ratification Standards One of Duplantis’ previous marks wasn’t ratified because they used high school (not international) pegs. Former U.S. Olympian Erin Donohue Fondly Remembers Winning 3 Distance Relay Titles With Shalane Flanagan And Alice Schmidt For UNC In 2003 All three of the Carolina stars made the Olympics. Will This Be The Last Season Of Caster Semenya Dominance? IAAF Statement On “New Eligibility Regulations For Female Classification” The new regulations limiting female testosterone levels will come into effect on November 1, 2018. Sunday: Stephen Sambu And Buze Diriba Lead Fields For This Weekend’s UAE Healthy Kidney 10K Laura Thweatt is in the women’s race making her comeback after a year-long injury while Sambu will face 2008 Olympic bronze medalist Edwin Soi. May 6: 2016 Olympic Triathlon Gold Medalist Gwen Jorgensen To Make Half Marathon Debut At 2018 USATF Championships This year’s USA Half Champs are being hosted by the Pittsburgh Marathon. Eliud Kipchoge And Mary Keitany Win World Marathon Major Series Titles And $250,000 Prize Money Kipchoge won his third consecutive WMM title while Keitany tied Tirunesh Dibaba, but was declared the winner since she beat Dibaba in London. 2017. *MB: Yuki took 3rd in WMM $25,000 more in prize money for Kawauchi. After A Successful Second Attempt, Mo Farah Now Has His Sights Set On Becoming A World Champion In The Marathon Farah says he might run another marathon in the fall and then focus on Doha Worlds. Despite Breaking The Record For The Hottest Race Day, London Had A Record 40,255 Finishers This after 41,003 started the race. Masterchef TV Contest Matt Campbell Dies At 22.5 Mile Mark Of London Marathon It was his 2nd marathon in two weeks. Eugene Resident Suffers Skull And Neck Fractures After Tree Falls On Her In Middle Of Half Marathon In Freak Accident Alan Webb‘s wife was nearby and sprinted to an aid station to get help. 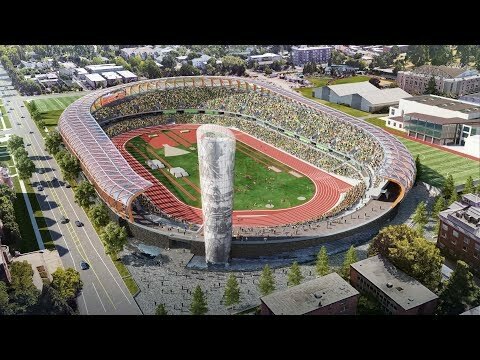 Opponents Of Tearing Down Hayward Field’s East Grandstand Get Support From Eugene City Council The council voted to consider forwarding an application to the Eugene Historic Review Board for Hayward to be considered a city landmark after passionate testimony from many including Kenny Moore and Neta Prefontaine (sister of Steve Prefontaine). Updated Women’s NCAA Rankings Have A Ton Of Teams Shuffle Positions LSU moved up to #1 with Southern California going from 6th to 2nd and Oregon from 4th to 3rd. Georgia is ranked 4th and Arkansas dropped from 1st to 5th. Florida And Texas Tech Remain 1-2 In The Latest Men’s NCAA Rankings Alabama made a big jump from 8th to 3rd. Podcast Interview With Georgia Head Coach Petros Kyprianou The USTFCCCA Coach Of The Year talks about the technical side of field events, championship team strategies and strength and conditioning. Previous Result: Georgia’s Keturah Orji Jumps #2 All-Time NCAA Mark Of 14.33m In Season Debut The mark is only behind her own NCAA record of 14.53m. Mo Farah Says He’ll Skip Euro 2019 Champs To Focus On Doha Worlds This really should go without saying since Farah is done with the track and he’s obviously not going to run the European Champs marathon …World Champs or not. LRC Galen Rupp Is BAAACK- Will Run Prague Marathon May 6th He’ll take on 2:04:08 guy Sisay Lemma, whom he beat in Chicago last year. Discuss: Galen Rupp listed on the entry list for Prague Marathon (May 6) + other elites Props to message boarder juddy96 for breaking this news. May 25: Evan Jager Vs. Conseslus Kipruto Matchup Set For Pre Classic The field also has Worlds silver medalist Soufiane El Bakkali, Jarius Birech, Stanley Kebenei, Andy Bayer, Canada’s Matt Hughes, #3 all-time Paul Kipsiele Koech. May 4: Christian Taylor, Keni Harrison And Sandra Perkovic Announced For Doha DLMay 4: Christian Taylor, Keni Harrison And Sandra Perkovic Announced For Doha DL Taylor will be up against Cuba’s Pedro Pablo Pichardo. LRC Final Crazy 4:22 Opening Mile And 13:48 Opening 5k Can’t Stop Eliud Kipchoge From Winning London In 2:04:17 And Showing He’s Still The Greatest On The Planet A 4:22 opening mile and 13:48 first 5k were way too fast, but they couldn’t stop Eliud Kipchoge from winning London. LRC Final Vivian Cheruiyot Does It Again, Pulls Off Huge Upset And Wins 2018 London Marathon In 2:18:31 Vivian Cheruiyot stunned the world and Almaz Ayana in Rio in 2016. Today she stunned Tirunesh Dibaba and Mary Keitany and won the 2018 Virgin Money Marathon thanks to a massive 5-minute PR. LRC With A New Approach, Tactics And London Victory, Vivian Cheruiyot Is Now One Of The Greatest Marathoners In The World This article was pulled from our final women’s recap above. Nancy Kiprop (2:24:18) Successfully Defends Her Title At The Vienna City Marathon As Morocco’s Salaheddine Bounasser Gets The Surprise Men’s Win (2:09:29) And the shock of the weekend, world record holder Dennis Kimetto was a DNF. He made it a little over halfway. Nicholas Kosimbei (61:12) And Degitu Azmeraw (69:53) Triumph At Gifu Seiryu Half Marathon Just five days after winning the Boston Marathon, Yuki Kawauchi ran 64:35 for 14th. Ethiopia’s Mosinet Geremew (61:31) Gets His 4th Straight Victory At The Yangzhous Half Marathon In China Ababel Yeshaneh won the women’s race in 69:06.